Bayern Munich boss Pep Guardiola praised his predecessor Jupp Heynckes after the club won the Bundesliga for a record fourth year in a row. Heynckes retired in 2013 after winning the title, and Guardiola secured a third championship in three attempts on Saturday with a 2-1 win at Ingolstadt. "I'd like to share this title with Jupp," said Guardiola. "We've done something quite remarkable." Guardiola, 45, is leaving Bayern this summer to take over at Manchester City. The former Barcelona boss had been in a spiky mood on the eve of his penultimate league game following Bayern's midweek defeat by Atletico Madrid on away goals in the Champions League. He had accused a dressing-room mole of "damaging" Bayern, after details of an alleged row in the wake of Tuesday's European exit were made public. 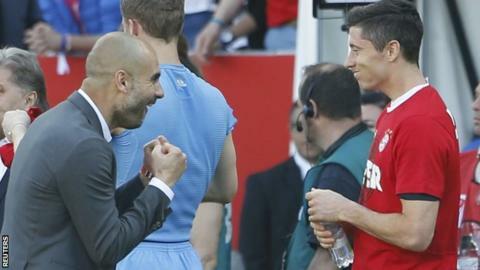 On Saturday, Guardiola said he would look back with pride on what he had achieved in Munich. "Many thanks to everybody, to all the people in Germany," he said. "I have been delighted with the experience I have had here. I want to pay a huge compliment to everybody who works here, to the fans and to the exceptional players. "Every single one of them have helped us. And big compliments too to Borussia Dortmund, who have been huge rivals for us." Bayern will pick up their latest Bundesliga trophy after the last league game of the season against relegated Hannover at the Allianz Arena next Saturday.